Ortho Molecular Products Gastrointestinal/Digestive - Ortho Digestzyme. Abdominal bloating and gas that occurs after eating may be signs that your digestive system isn't working optimally. Your Stomach is responsible for digesting or breaking down the food you eat&sbquo; which allows the nutrients to be retrieved from it and made available to your body. In order to do this&sbquo; your stomach has to have the right conditions: it must have the proper acidity to break down foods&sbquo; as well as enough digestive enzymes to process proteins&sbquo; fats&sbquo; and nutrients. Several factors can cause poor digestion. An unbalanced diet or the overuse of antacids may cause low stomach acidity. On the other hand&sbquo; your pancreas may not be producing enough sufficient levels of digestive enzymes&sbquo; or your liver may not be producing enough bile (bile is a substance your stomach uses to break down dietary fats). 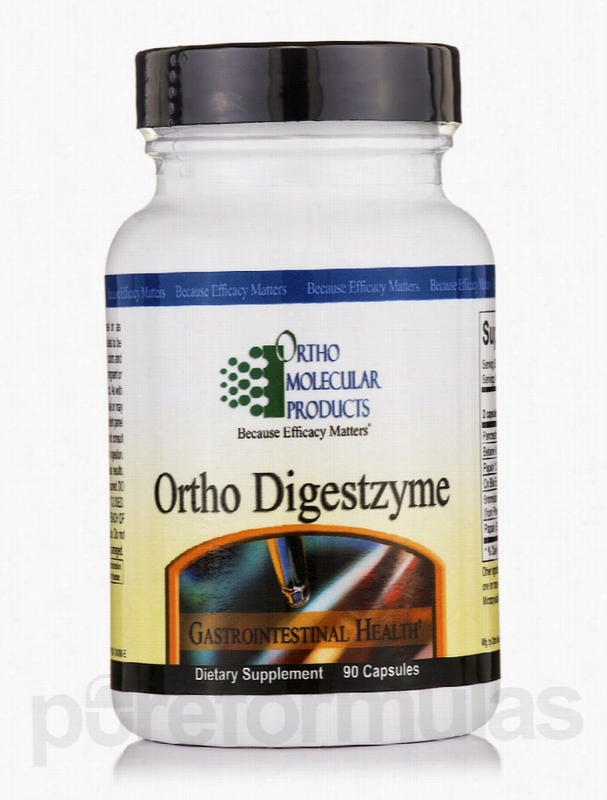 You may be able to support your digestive tract with a supplement like Ortho Molecular Products&rsquo; Ortho DigestZyme. Each capsule provides the following active ingredients: Pancreatin&mdash;may promote pancreatic health Betaine HCI&mdash;can increase stomach acidity to promote better digestion Pepsin&mdash;an enzyme that helps your body break down proteins Ox bile extract&mdash;may stimulate increased bile production Bromelain&mdash;an enzyme naturally derived from pineapples that helps your body break down food Papain&mdash;enzyme that may alleviate flatulence and bloat This 90-capsule bottle of DigestZyme by Ortho Molecular Products will last from two weeks to one month if you take the recommended dosage of one or two capsules&sbquo; 15 minutes before each meal. Ortho Molecular Products prides itself on making effective supplements from scientifically designed formulas. For over 20 years&sbquo; they&rsquo;ve been providing proven products with superior raw ingredients. Their manufacturing practices rise above industry standards and regulations. The most important priority for Ortho Molecular Products is that those who use its supplements get and stay healthy as soon as possible. These statements have not been evaluated by the Food and Drug Administration (FDA). These products are not meant to diagnoseÃ¢ÂÂ treat or cure any disease or medical condition. Please consult your doctor before starting any exercise or nutritional supplement program or before using these or any product during pregnancy or if you have a serious medical condition. 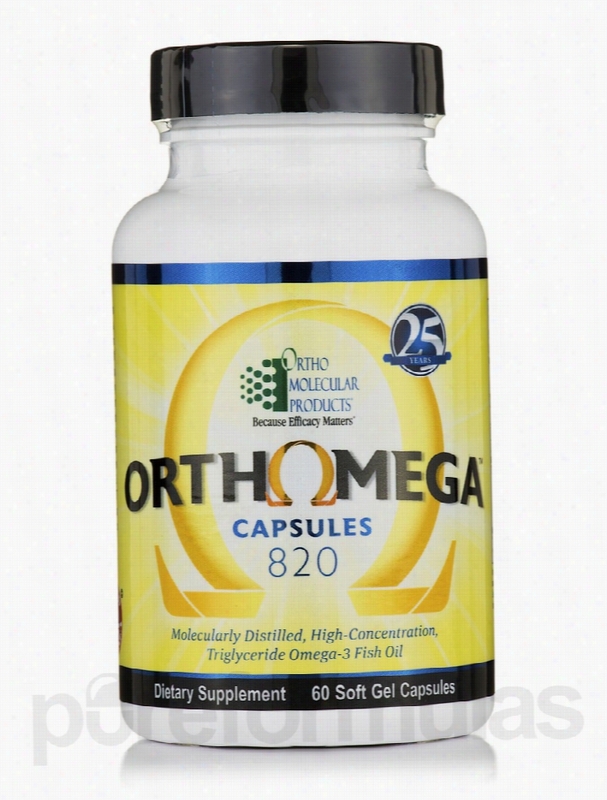 Ortho Molecular Products Cardiovascular Support - Orthomega 820 - 60. You may have heard that a healthy diet should include at least two servings of fish every week. Salmon&sbquo; sardines&sbquo; tuna&sbquo; and other oily fish are very rich in omega-3 fatty acids&sbquo; which are known for their health benefits. This is why you should incorporate these fish oils into your diet if you aren't doing so already. 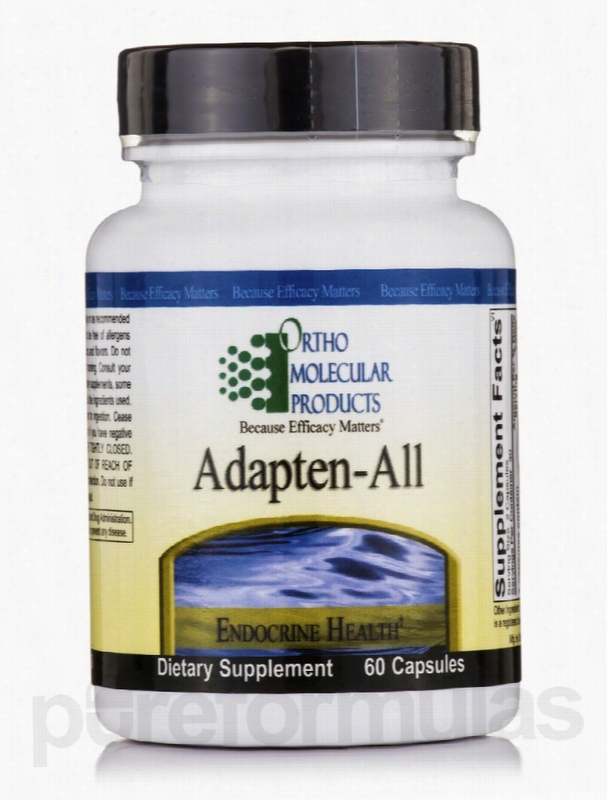 The most well-known omega-3s are EPA (eicosapentaenoic acid) and DHA (docosahexaenoic acid). Both have been found to have positive effects on heart health&sbquo; joint problems&sbquo; skin conditions&sbquo; and brain functioning. EPA and DHA have also been associated with a strengthened immune system&sbquo; which could help you fight off illness and infection. These fatty acids may also promote healthy vision. Other evidence shows that these omega-3 fatty acids can support cardiovascular health. Unfortunately&sbquo; eating enough seafood can be hard to do. The good news is that there&rsquo;s other ways of getting the omega-3 fatty acids you need. Taking a supplement like Ortho Molecular Products&rsquo; Orthomega provides 420 mg of EPA&sbquo; and 300 mg of DHA in every capsule. These soft gels are easy to swallow and absorb&sbquo; with less of a fishy taste. Each bottle of Orthomega by Ortho Molecular Products contains 60 soft gel capsules&sbquo; which should last for about two months if you take the recommended dosage of one soft gel capsule per day. Ortho Molecular Products prides itself on making effective supplements from scientifically designed formulas. For over 20 years&sbquo; they&rsquo;ve been providing proven products with superior raw ingredients. Their manufacturing practices rise above industry standards and regulations. The most important priority for Ortho Molecular Products is that those who use its supplements get and stay healthy as soon as possible. These statements have not been evaluated by the Food and Drug Administration (FDA). These products are not meant to diagnoseÃ¢ÂÂ treat or cure any disease or medical condition. Please consult your doctor before starting any exercise or Nutritional supplement program or before using these or any product during pregnancy or if you have a serious medical condition. Ortho Molecular Products Cardiovascular Support - Folic Acid 5 mg -. Your body makes an amino acid called homocysteine from certain foods you eat. Amino acids are usually good for you&sbquo; since your body creates proteins from them. Unfortunately&sbquo; they can sometimes be harmful. If excessively high levels of homocysteine are present&sbquo; you may face Health risks. This amino acid can make your arteries harder and narrower&sbquo; making it difficult for blood to get through and reach other parts of your body. You might also be more prone to blood clots&sbquo; which make it even tougher for blood to flow through your blood vessels. You might have higher homocysteine levels if you eat a diet that contains a lot of protein from sources like meat&sbquo; fish&sbquo; and eggs. Having low levels of a B vitamin called folic acid can also bump your homocysteine levels up. If you do have too much of this amino acid&sbquo; taking a folic acid supplement can help. 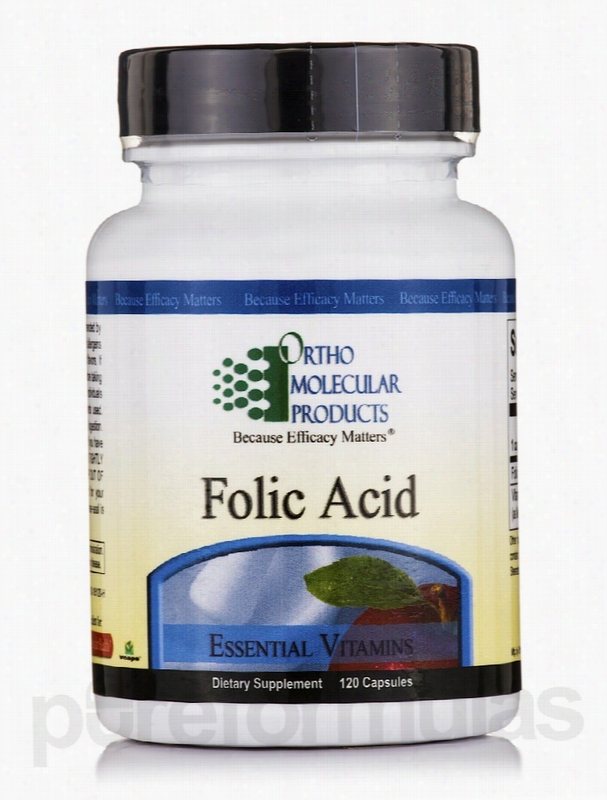 Ortho Molecular Products&rsquo; Folic Acid 5 mg gives your body what it needs to decrease homocysteine levels. Folic acid helps your body produce new cells; your body needs it in order to help turn homocysteine into methionine&sbquo; another type of amino acid. Giving your body more of this B vitamin helps you get rid of excess homocysteine. Each Folic Acid capsule contains 5 mg of folic acid&sbquo; along with 200 mcg of vitamin B12 to provide additional support for balancing the level of homocysteine present in your body. Each bottle of Folic Acid 5 mg by Ortho Molecular Products contains 120 capsules&sbquo; which is enough to last for up to four months. Take one capsule daily&sbquo; unless otherwise directed by your doctor. Ortho Molecular Products prides itself on making effective supplements from scientifically designed formulas. For over 20 years&sbquo; they&rsquo;ve been providing proven products with superior raw ingredients. Their manufacturing practices rise above industry standards and regulations. The most important priority for Ortho Molecular Products is that those who use its supplements get and stay healthy as soon as possible. These statements have not been evaluated by the Food and Drug Administration (FDA). These products are not meant to diagnoseÃ¢ÂÂ treat or cure any disease or medical condition. Please consult your doctor before starting any exercise or nutritional supplement program or before using these or any product during pregnancy or if you have a serious medical condition. Ortho Molecular Products Joint Support - Vitamin K2 with D3 - 30. You've probably heard for years that calcium is absolutely essential to the health of your bones. However&sbquo; it&rsquo;s not the only nutrient you need. In addition to that mineral&sbquo; vitamins K2 and D3 have gained recognition for also supporting the growth and maintenance of strong and healthy bones. Vitamin D3 is absolutely essential to the absorption of calcium. Without this vitamin&sbquo; the calcium you get through your diet wouldn't be absorbed properly; what isn't absorbed by your body would then be removed as waste&sbquo; causing you and your bones to miss out on this important mineral. It also supports Cardiovascular health and a good mood. This vitamin can be absorbed from the sun or certain fortified foods&sbquo; but taking a supplement is a convenient way to ensure sufficient levels of it. Meanwhile&sbquo; vitamin K2 may also be important to the formation of strong bones. Vitamin K2 tells your body where to send the calcium it absorbs&sbquo; which works to prevent the calcification (excessive presence of calcium) of your blood vessels. In addition to helping prevent the deterioration of your bones and blood vessels&sbquo; vitamin K2 also helps with the formation of blood clots to keep you from bleeding excessively after an injury. In order to experience all of the benefits both vitamins can offer&sbquo; you might want to consider taking a supplement. 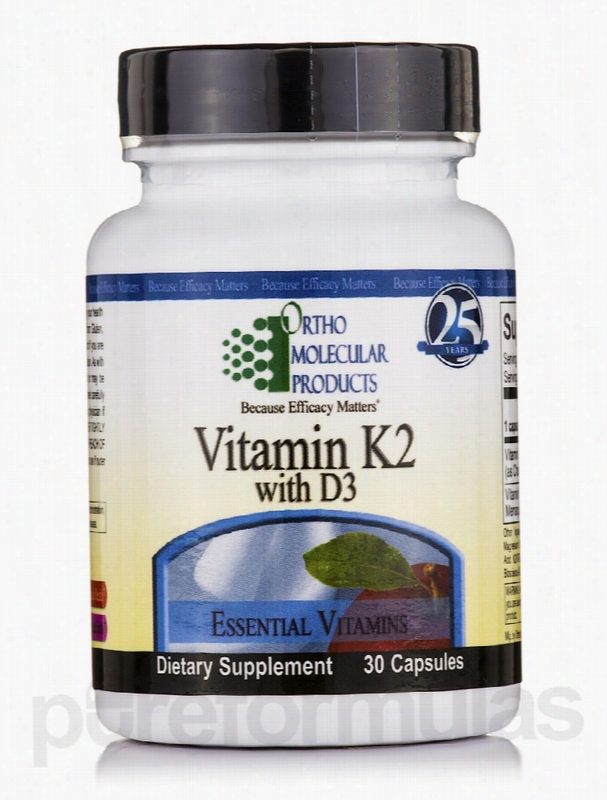 Ortho Molecular Products&rsquo; Vitamin K2 with D3 provides a healthy balance. Each capsule contains 5&sbquo;000 IU of vitamin D and 45 mcg of vitamin K. When taken at the recommended dosage of one capsule per day&sbquo; one 30-capsule bottle of Vitamin K2 with D3 by Ortho Molecular Products should last for about one month. Ortho Molecular Products prides itself on making effective supplements from scientifically designed formulas. For over 20 years&sbquo; they&rsquo;ve been providing proven products with superior raw ingredients. Their manufacturing practices rise above industry standards and regulations. The most important priority for Ortho Molecular Products is that those who use its supplements get and stay healthy as soon as possible. These statements have not been evaluated by the Food and Drug Administration (FDA). These products are not meant to diagnoseÃ¢ÂÂ treat or cure any disease or medical condition. Please consult your doctor before starting any exercise or nutritional supplement program or before using these or any product during pregnancy or if you have a serious medical condition. Ortho Molecular Products Hormone/Glandular Support - Adapten-All - 60. If you&rsquo;ve been under a lot of Stress and are feeling overwhelmed or irritable&sbquo; your adrenal glands may be overworked. These glands produce over 50 types of hormones that your body needs&sbquo; including adrenaline and cortisol&sbquo; which are stress hormones. The purpose of these stress hormones is to give you a boost of energy and mental clarity in times of stress. However&sbquo; being under frequent stress can cause them to become overworked; this may negatively impact their production of sufficient adrenaline&sbquo; cortisol&sbquo; or other hormones. Other signs that your adrenal glands may be overworked may include oversensitivity to cold&sbquo; slower healing from illnesses and injuries&sbquo; digestive problems&sbquo; and increased allergic symptoms. Your doctor can check your adrenal gland hormone levels by performing a blood test. If your hormone levels are low&sbquo; you may want to take a convenient dietary supplement like Ortho Molecular Products&rsquo; Adapten-All. 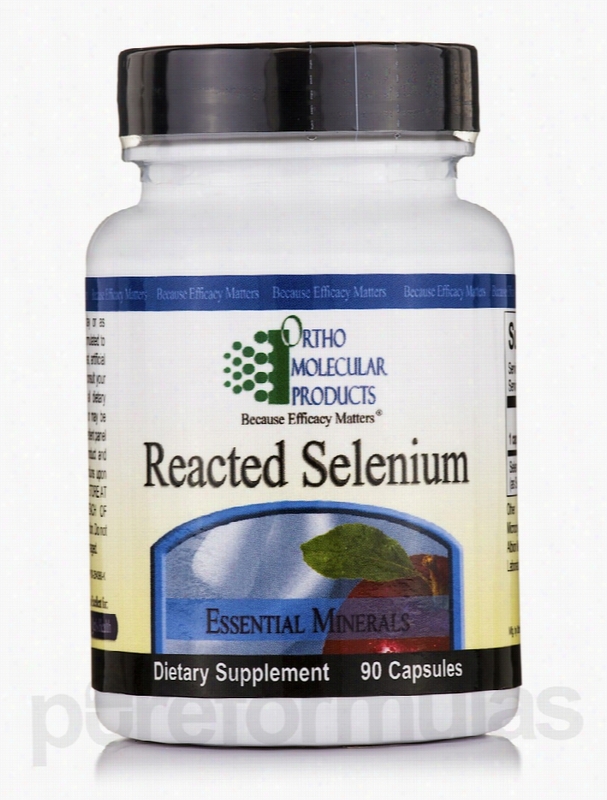 Each capsule contains nutrients and herbs that may support adrenal health. The active ingredients in Adapten-All are: Vitamins A&sbquo; B6&sbquo; B12&sbquo; C&sbquo; E&sbquo; Niacin&sbquo; and Pantothenic Acid&mdash;nutrients your adrenal glands need in order to function properly Eleuthero (Siberian Ginseng) root extract&mdash;may help reduce your stress levels and may help your adrenal glands produce the right amount of adrenaline Rhodiola rosea and ashwaganda root extract&mdash;may help regulate your cortisol levels Schizandra berry extract&mdash;which may help regulate your stress hormones Licorice root extract&mdash;which may help your body utilize cortisol (commonly known as the stress hormone) more effectively This 60-capsule bottle of Adapten-All by Ortho Molecular Products will last you from 10 to 20 days&sbquo; depending on your dosage. The recommended dosage is three capsules&sbquo; once or twice daily. Don't use this supplement if you're pregnant or nursing. Ortho Molecular Products prides itself on making effective supplements from scientifically designed formulas. For over 20 years&sbquo; they&rsquo;ve been providing proven products with superior raw ingredients. Their manufacturing practices rise above industry standards and regulations. The most important priority for Ortho Molecular Products is that those who use its supplements get and stay healthy as soon as possible. These statements have not been evaluated by the Food and Drug Administration (FDA). These products are not meant to diagnoseÃ¢ÂÂ treat or cure any disease or medical condition. Please consult your doctor before starting any exercise or nutritional supplement program or before using these or any product during pregnancy or if you have a serious medical condition. 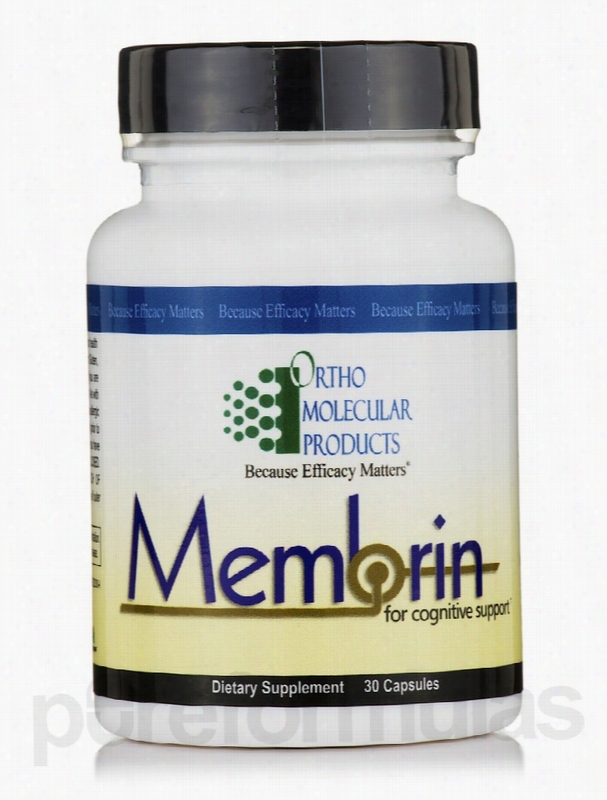 Ortho Molecular Products Memory/Cognitive Support - Membrin - 30. As you age&sbquo; a lot of things begin to change. Your memory and cognitive function usually begin to decline&sbquo; but there are things you can do to slow that deterioration. Eating a healthy diet and working out on a regular basis can help&sbquo; as well as performing mental exercises like memory games. If you do all of these things and still feel like your mind is fuzzy&sbquo; a supplement may be right for you. Ortho Molecular Products&rsquo; Membrin contains a blend of ingredients that support brain power&sbquo; concentration&sbquo; and your ability to remember. Taking this supplement can help you hold onto your memory and keep your mind working well&sbquo; even as you get older. Some of the ingredients in each capsule Membrin include: Ginkgo biloba leaf extract: an herb that may improve memory&sbquo; concentration&sbquo; and other cognitive functions by enhancing the utilization of oxygen; it may also boost your mood Vinpocetine: a man-made mineral that can promote better memory Huperzine alkaloids: may help improve cognitive function One bottle of Membrin by Ortho Molecular Products contains 30 capsules&sbquo; which should last for about one month if you take the recommended dosage of one capsule daily. Ortho Molecular Products prides itself on making effective supplements from scientifically designed formulas. For over 20 years&sbquo; they&rsquo;ve been providing proven products with superior raw ingredients. Their manufacturing practices rise above industry standards and regulations. The most important priority for Ortho Molecular Products is that those who use its supplements get and stay healthy as soon as possible. These statements have not been evaluated by the Food and Drug Administration (FDA). These products are not meant to diagnoseÃ¢ÂÂ treat or cure any disease or medical condition. Please consult your doctor before starting any exercise or nutritional supplement program or before using these or any product during pregnancy or if you have a serious medical condition. 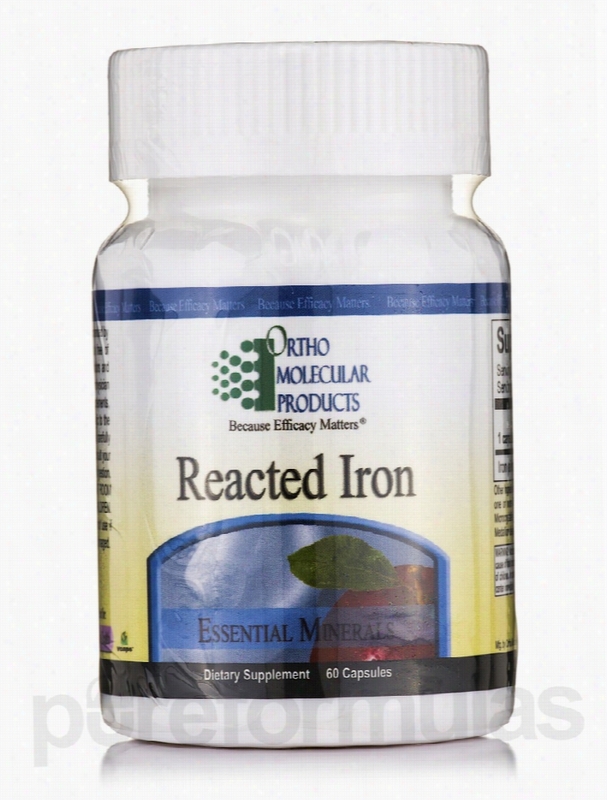 Ortho Molecular Products Minerals - Reacted Iron - 60 Capsules. Every cell in your body contains iron&sbquo; the essential mineral your body needs in order to carry and store oxygen throughout your body&sbquo; as well as to produce digestive enzymes. If you&rsquo;re deficient in iron (a condition that can lead to iron-related anemia)&sbquo; you might feel tired or weak&sbquo; get sick often&sbquo; feel an unexplained chill&sbquo; have trouble concentrating&sbquo; or have an inflamed tongue. You can become iron-deficient due to blood loss (commonly from heavy menstrual periods)&sbquo; frequent antacid use&sbquo; or by eating a diet low in iron. Children and pregnant women have a higher risk than others of becoming iron-deficient because they have higher iron requirements. You can avoid or alleviate an iron deficiency by eating plenty of foods rich in iron. Meat is the best source of iron. Vegetarians and vegans can get iron from leafy green vegetables and legumes&sbquo; but the iron found in these foods is not as easily absorbed. If you&rsquo;re a vegetarian or vegan&sbquo; you should eat foods that contain vitamin C&mdash;such as citrus fruits&mdash;in the same meal as plant-based iron foods to promote increased iron absorption. If you are iron-deficient or eat a diet low in iron&sbquo; you can take Reacted Iron by Ortho Molecular Products to fulfill your body&rsquo;s iron requirements. This supplement contains the mineral in the easy-to-absorb form of ferrochel ferrous bisglycinate chelate. Unlike the iron found in many other supplements&sbquo; it&rsquo;s less likely to cause uncomfortable constipation. This 60-capsule bottle of Ortho Molecular Products&rsquo; Reacted Iron will last you for two months at the recommended dosage of one capsule daily. Ask your Health care provider before taking this supplement if you&rsquo;re pregnant or nursing. Ortho Molecular Products prides itself on making effective supplements from scientifically designed formulas. For over 20 years&sbquo; they&rsquo;ve been providing proven products with superior raw ingredients. Their manufacturing practices rise above industry standards and regulations. The most important priority for Ortho Molecular Products is that those who use its supplements get and stay healthy as soon as possible. These statements have not been evaluated by the Food and Drug Administration (FDA). These products are not meant to diagnoseÃ¢ÂÂ treat or cure any disease or medical condition. Please consult your doctor before starting any exercise or nutritional supplement program or before using these or any product during pregnancy or if you have a serious medical condition. Ortho Molecular Products Allergy Relief - D-Hist Jr. - 60 Chewable. It&rsquo;s projected that up to 50 million Americans suffer from allergies&mdash;some so severe that they can&rsquo;t even go outside during Allergy season! It&rsquo;s even worse for kids&sbquo; who want to be able to play with their friends. Does this sound like your child? This supplement is a potential solution. Ortho Molecular Products&rsquo; D-Hist Jr. is used to reduce the symptoms caused by occasional allergies&sbquo; such as a stuffy nose&sbquo; watery eyes&sbquo; or coughing. D-Hist Jr. is similar to Natural D-Hist&sbquo; except that it&rsquo;s been modified to be suitable for children. The chewable tablets are easy to digest. With D-Hist Jr.&rsquo;s special formula&sbquo; you and your children will be able to enjoy the outdoors during any time of year. The ingredients in D-Hist Jr. include: Vitamin C: It&rsquo;s used in so many bodily functions and is often used to relieve symptoms of the common cold. It may also act as an antihistamine&sbquo; reducing histamine levels. Quercetin: A flavonoid found in red wine and other foods that protects your body&rsquo;s cells from free radicals and oxidation. Quercetin may also act as an anti-inflammatory to decrease allergy symptoms by blocking histamine production; histamine is a chemical that produces allergic reactions such as sneezing&sbquo; nasal congestion&sbquo; and itchy skin. Stinging nettles leaf: Includes several flavonoids that promote healthy cells&sbquo; while also having pain-relieving and anti-inflammatory properties that may lessen the symptoms of common allergies. Bromelain: An enzyme found in pineapples that contains anti-inflammatory properties and may help reduce sinus inflammation. N-Acetyl L-Cysteine (NAC): A natural mucolytic agent that helps dissolve thick mucus&sbquo; promoting clear breathing and decongestion. 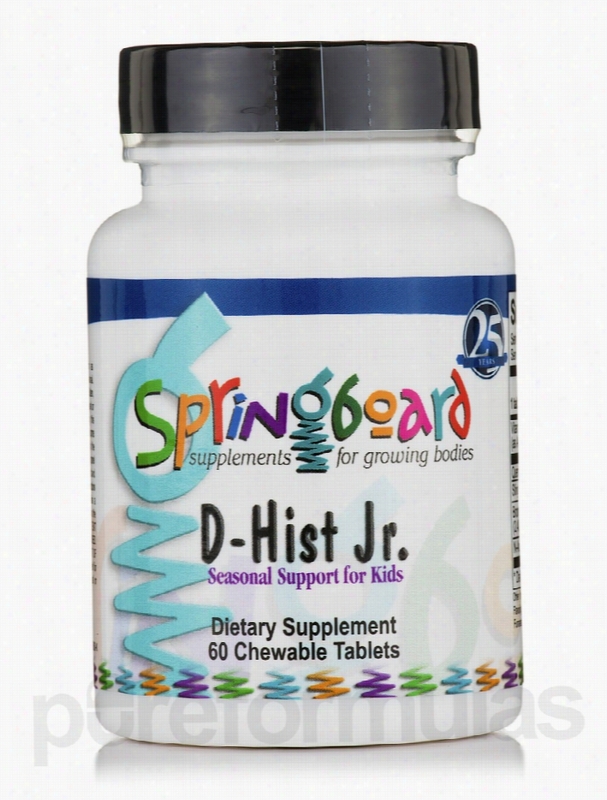 Help your child feel better today with D-Hist Jr. chewable tablets. Ortho Molecular Products prides itself on making effective supplements from scientifically designed formulas. For over 20 years&sbquo; they&rsquo;ve been providing proven products with superior raw ingredients. Their manufacturing practices rise above industry standards and regulations. The most important priority for Ortho Molecular Products is that those who use its supplements get and stay healthy as soon as possible. These statements have not been evaluated by the Food and Drug Administration (FDA). These products are not meant to diagnoseÃ¢ÂÂ treat or cure any disease or medical condition. Please consult your doctor before starting any exercise or nutritional supplement program or before using these or any product during pregnancy or if you have a serious medical condition. 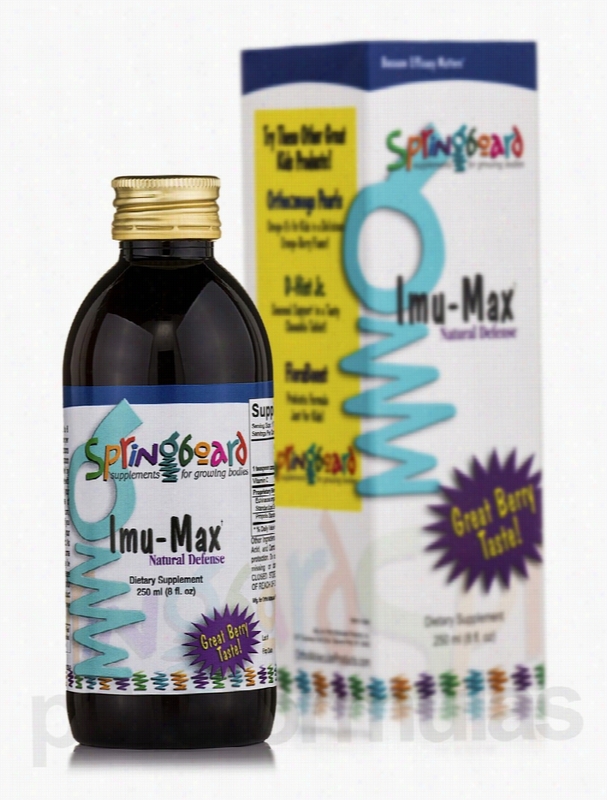 Ortho Molecular Products Children's Formulas - Imu-Max - 8 fl. oz (250. Your immune system is made up of tissues&sbquo; cells&sbquo; organs&sbquo; and proteins that work together to protect your body from illness and disease. A diet lacking in proper Nutrition&sbquo; smoking&sbquo; or being under stress can all result in weakened immunity. Eating more fruits and vegetables&sbquo; especially those high in vitamin C&sbquo; may strengthen your immune system; even getting enough sleep can have a positive impact on its performance. If you already do all of these things and still get sick often&sbquo; you can try a supplement like Ortho Molecular Products&rsquo; Imu-Max. It contains a blend of ingredients that are known for their positive effects on the immune system. Taking this liquid supplement may help you fight off an illness you have or help you avoid getting sick. There are some ingredients in this supplement that may also help treat inflammation&sbquo; which is an uncomfortable symptom associated with a variety of health problems. Some of the ingredients in Imu-Max include: Propolis Standardized Extract&sbquo; which is often used to support the immune system and alleviate inflammation Vitamin C&sbquo; which the body needs in order to grow and develop properly&sbquo; as well as support immunity. Adults should take one tablespoon of Imu-Max by Ortho Molecular Products twice daily. Children between the ages of six and 11 may take one or two teaspoons twice daily&sbquo; while kids under the age of six should take from &frac12; to one teaspoon twice a day. Ortho Molecular Products prides itself on making effective supplements from scientifically designed formulas. For over 20 years&sbquo; they&rsquo;ve been providing proven products with superior raw ingredients. Their manufacturing practices rise above industry standards and regulations. The most important priority for Ortho Molecular Products is that those who use its supplements get and stay healthy as soon as possible. These statements have not been evaluated by the Food and Drug Administration (FDA). These products are not meant to diagnoseÃ¢ÂÂ treat or cure any disease or medical condition. Please consult your doctor before starting any exercise or nutritional supplement program or before using these or any product during pregnancy or if you have a serious medical condition.